We are having an Open House! Click here for more information! Congratulations Gabriella Catanuto for Probationary Member of the Year and Mike Ryan for Member of the Year for 2018! Also Congratulations to George Burmester for the “Ex-Chief James Henderson Memorial Award for Exceptional Service” in 2018! Thank you for visiting the East Moriches Community Ambulance Website. Our Mission is to provide 24/7 medical care to the residents of our community. We also provide low cost CPR instruction to interested residents, a supply of medical equipment for residents in need and we have a junior program that is aimed at mentoring our communities youth. 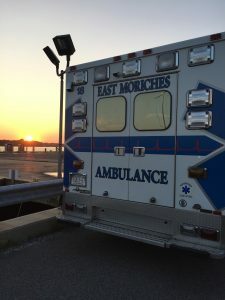 The East Moriches Community Ambulance was founded in 1929 by dedicated volunteers. Today it has grown into an outstanding agency that provides advanced life support and transportation to our surrounding hospitals. Without the dedicated volunteers and the support of our residents, this would not be possible. 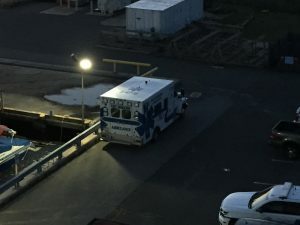 East Moriches Ambulance, 5-47-18, at a tour of the USCG Station Moriches Boat Ramp with a short explanation in regards to the USCG, EMCA, and EMFD about water rescues. August 30, 2017.